The title of this post is a little deceiving I am convinced that this is just the normal pace of life and if I keep waiting for life to slow down, I’m going to miss the present. I have to make a deliberate effort to do that…to not keep waiting for the next phase. In spite of all this, we have slowed down a little bit. The month of February is always crazy at our house. Carter and Seth both have birthdays and this year we had promised each of them a party. We also had several events at school that required extra work. I was SO glad to see March arrive last Friday! 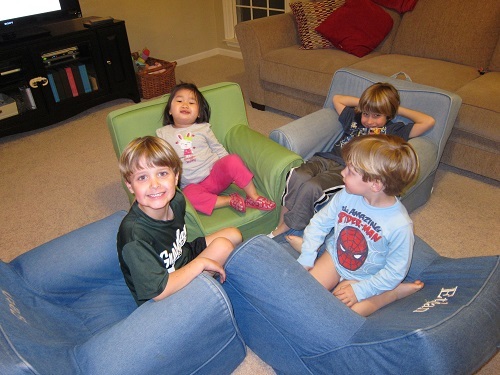 I will do birthday party posts soon but here are a few pictures of the kids at home. I also want to update you on Molly Kate soon. She is doing SOOO well. 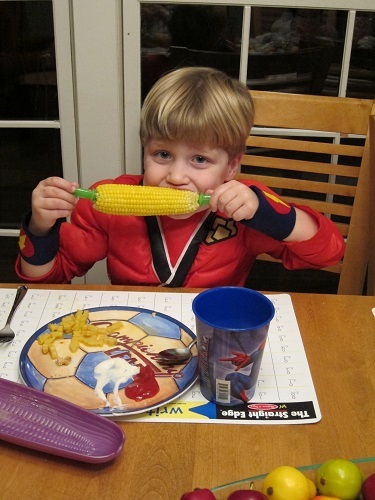 Ethan digging into his first ear of corn this year (dressed as a Power Ranger). 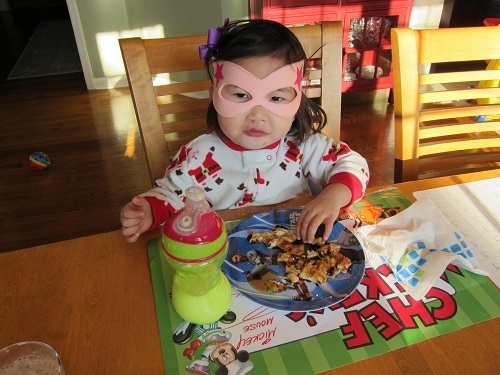 Ethan and Molly Kate went to a Super Hero party earlier in the month and received these adorable party favors. They still wear them all the time! 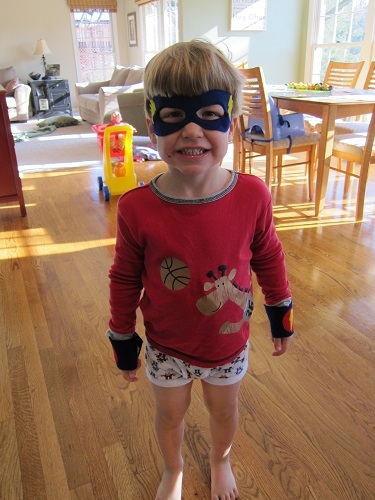 And not to be outdone…our other super hero! 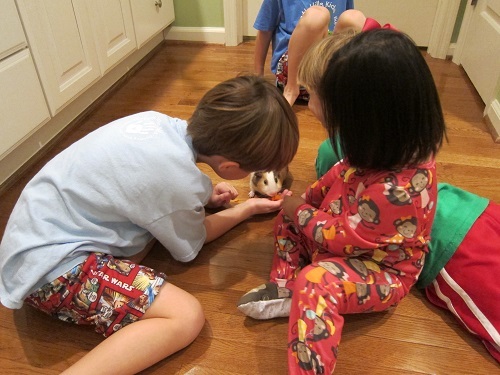 Rocket (our pet guinea pig) is slowing getting used to the craziness of this family. For the first few weeks he hid in his little house all the time. He will now come out when we are in the room and allows the kids to feed him. We got him out of his cage and let him run around in our bathroom the other day. It was the only room we could think of that didn’t have places where he could hide. The kids love playing with him! Despite all the fights and hitting, they love each other so much. The majority of time they play SO well together and like to play with each other. I’m so thankful to be their mama.